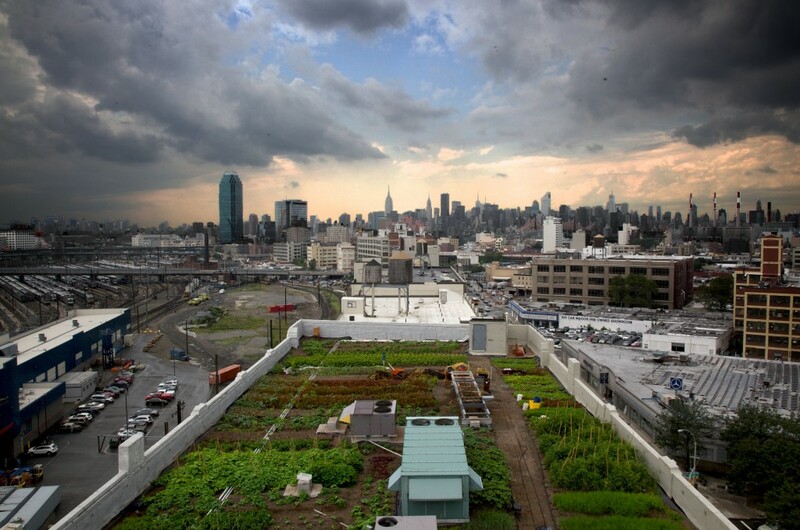 I’m Farm Manager this season at Brooklyn Grange, a multi-acre practicing-organic soil-based rooftop farm in New York City, with locations in Long Island City and the Brooklyn Navy Yard. We grow greens, tomatoes, herbs, and a variety of other seasonal fruits and veggies. We keep laying hens and bees and as a special project are developing a large-scale apiary this season with about 30 beehives. We have a CSA and sell at farmstands and to local restaurants, cafés and small food businesses. I’d been interested in food and agriculture for several years, spending more time at local greenmarkets in the city, talking to farmers, and learning more about our messy food system. Over the years, I started experimenting with small-scale urban homesteading and learned how to grow food and compost waste, and as I got more interested in that aspect of homesteading I started to consider larger-scale farming as a career opportunity. I apprenticed last season with Brooklyn Grange, and by the end of that experience there was no turning back for me. What did you do before you started farming? Have you found it be an easy transition from your previous job? I worked for a tech startup in the online media and advertising industry for a couple of years after graduating from school, focusing on analytics and sales. It was a great experience, and I learned quite a bit about business, but I ultimately knew that it wasn’t where I belonged. As I learned more about the failures of our local, national, and global food systems, and got more riled up about consolidated global corporate infrastructure and its infiltration of our politics, I decided I couldn’t keep helping to feed the beast anymore and quit. The transition to farming was easy in a moral, subjective sense because I felt like I was heading toward something I really wanted to do and which worked against the evil I saw in the system. My previous experience in business has also been helpful in hitting the ground running. But the transition has had its hard parts too: the physical labor is difficult and painful at times, and the constant on-call aspect of running a small farm business can be taxing. But even on my most strenuous days as a farmer, I’m content, excited, and fulfilled to be pursuing my dream. What made you choose New York? I came to New York City for school and decided to stay for a while. The energy and vibrancy and hustle of the city pulls some people, like me, towards it. As a farmer now, I’m intrigued by the growing urban ag movement and think it’s a good place for me to continue cutting my farming teeth but also to help contribute to a new system that can feed and “green” cities at the same time. Though I do dream of heading to the country some day to work with livestock. What produce do you grow? Brooklyn Grange’s main crops are heirloom tomatoes, greens mixes, and herbs. But we also grow seasonal fruits and veggies like turnips, radishes, squashes, kales, chard, eggplants, peppers, strawberries, raspberries, and more. Our hens lay eggs, we sell honey from our four beehives, and we are developing cut flower and medicinal herb programs this season. We are building a large-scale apiary this season near our new farm in the Brooklyn Navy Yard and plan to produce thousands of pounds of honey annually. When and why did you become interested in farming? As a youngster, my mother and I had a small kitchen garden, and though nothing really came of it, I vividly remember being so excited about the little spindly carrots we pulled out of the ground. I spent summers with my grandparents on their farmstead in the North Carolina Smokies, gathering eggs, helping move cattle, and weeding the garden. I didn’t think much about farming at that point, but I credit those experiences with laying some groundwork. Here in the city, I was introduced to the local food movement by friends who frequented the greenmarket, and I quickly jumped on the bandwagon and really enjoyed eating seasonally. I guess that changing relationship with food made me more curious about food in general, so I started reading books and watching documentaries about our food system. I got more inspired, and started growing food on my rooftops, fire escapes, and balconies and really enjoyed that work. The possibility of a farming career started to pop into my head, and over time it made more and more sense that farming was one of the best ways I could tackle some of the food-system, environmental and consolidated-corporate issues I was passionate about. What difficulties have you had, or are you overcoming? And how? The main difficulty for me so far has been in keeping on top of all of the many moving parts of a small farm business: farm plans, schedules, records, interns and apprentices, administrative work, maintaining a social media presence, developing sales relationships, etcetera. I’ve managed to stay afloat so far by trying to stay as organized as possible, though things do slip here and there. Developing a good system and a good schedule for myself has been a priority, and though it’s been difficult doing the work and trying to organize the doing of the work simultaneously, it’s paying off and I think will help me be a better farmer and manager. What are your goals for the next 5 to 10 years? I hope to have contributed in a measurable way to the growth and development of urban agriculture, especially by conducting and sharing research on traditional or reimagined techniques and tools for efficiency and sustainability. I aspire to be running my own farm operation, continuing to learn how to farm better and inspiring and teaching other young aspiring farmers. What advice do you have for any other young farmers who are just starting out? Stretch your body! Go to bed early and get up early. Read, read, read, and read some more, and don’t limit yourself to books – the internet is a valuable tool for farmers. Don’t reinvent the wheel; talk to farmers, read and research what’s been successful and give it a shot. Get up to speed on global, national and local food/ag politics, and stay in the loop. Set up Google alerts for farming topics that interest you or that you want to pursue. If you haven’t had any experience growing, start a small herb garden, take notes, and learn, then scale up and try some tomatoes and greens next season. Do your homework and find a farm locally, online, and/or through WWOOF that you feel really matches your personality and goals, and be the best apprentice you can be. Learn as much as you can from your fellow farmers, and watch them rather than asking too many questions. Become a member of the National Young Farmers Coalition and any other local young-farmer promoting organizations near you or online. Read the Greenhorns blog and listen to Greenhorn radio. Remember, you’re pursuing a dream and your work is inherently, uncontroversially good work; keep your head up and eyes on the prize, and your hardest days and worst setbacks won’t keep you down for long. Michael Meier from Brooklyn Farm, 25 years old.